It’s been about three months since Apple first announced the iPod Touch and at this point just about all the major accessory makers have begun to ship out their products. We just got a hold of iFrogz‘s iPod Touch case called the Treadz. The silicone sleeve fits the iPod Touch neatly and leaves openings for the screen, ports, and buttons. I’m not going to say that this is necessarily the best case, but I do highly recommend purchasing some sort of protection for your $300-400 iPod Touch. The iFrogz iPod Touch Treadz protects the entire iPod Touch, but unfortunately leaves the entire touch screen unprotected. To solve that issue, I would recommend purchasing Ifrogz’s Protective Screen Film which will prevent the screen from getting scratched or collecting dust. The other openings for the hold button, dock connector, and headphone jack are the exactly the right sizes so there’s not much room for physical damage to occur through those areas. The only other major opening is the circle below the screen to allow access to the “Home” key. Reaching the key was a bit difficult since the silicone case is fairly thick around that area and will especially be a problem for those with large hands. Despite that there weren’t any other usability issues with the iFrogz Treadz. The case is only available in black at this time, but despite this it matches the style of the iPod Touch quite well. Another thing that I liked about the case was the fact that iFrogz didn’t place their branding all over the device as many other accessory vendors usually do. Instead the the text “iFrogz” is cleanly written on the sides, which doesn’t take away from the look and feel of the case. The case wasn’t all perfect. Ifrogz seems to have forgotten to leave an opening for the ambient light sensor at the top. So if you are using this case, the Auto Brightness option will probably be rendered useless. The folks over at iFrogz have just notified us that their cases now do have an opening for the ambient light sensor, so ignore our previous comment. Other than that, we didn’t really find any other major flaws. Everything worked as it should. 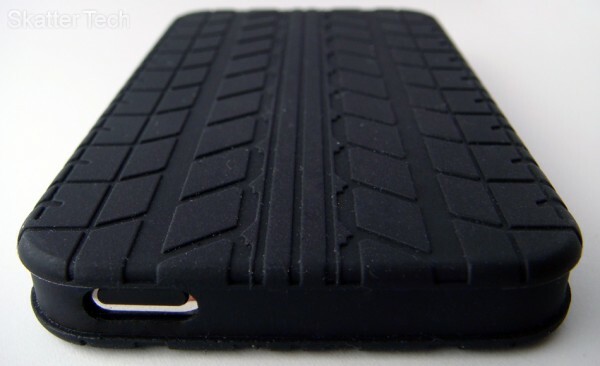 For the most part, iFrogz’s Treadz will do an excellent job of protecting the iPod Touch from small falls as well as regular wear and tear. The iFrogz iPod Touch Treadz case is available for purchase for $19 on iFrogz’s website. A protective film to protect the screen, which we highly recommends, will run you another $3. Follow the link provided below to buy your own iFrogz case for your 8GB/16GB Apple iPod Touch. Somehow you got one of our first cases. We’ve updated all of our Touch cases to have a cutout for the light sensors. It was probably a mix up on our end that you got this case. Get in touch with iFrogz customer service and we’ll be happy to exchange it for a new one with the cutout. i seriously gotta get a new case. i was retarded and didn’t get one when i bought my itouch and now its all scratched up everywhere on the back. i got a leather case for my birthday but it was fat and ugly. and tooooo hard to carray arround. i think im going to go get myself one of these. i wonder the apple store has got them. cuz i live like next door to it. p.s. love the ipod touch still! I got an iTouch about 3 days ago now.. was a bit iffy when i got it but i am so glad i got it now… Like the reader above i didn’t by a case. 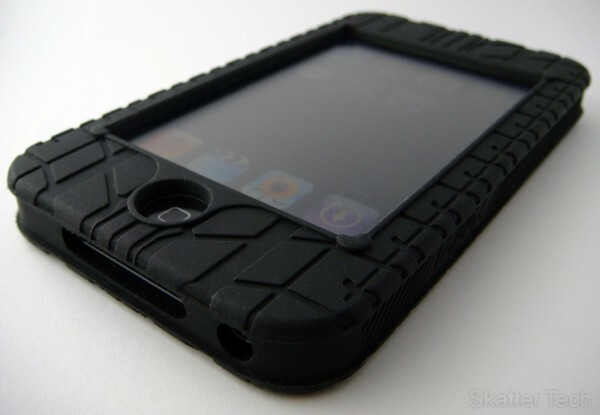 A question about this case… As its silicone i’m guessing it gets stuck while getting in/out of your pocket? Is this the case? As its silicone i’m guessing it gets stuck while getting in/out of your pocket? Is this the case? It will indeed be a bit sticky while trying to get it in/out of your jeans, but the material seems to be a bit different from other silicone products I’ve used. The sleeve isn’t attracting as much dust as I would have expected it too, so that’s a bonus. The case fits on quite tightly, so it won’t be too bad. The folks over at Agent 18 make a hardcase with openings for all the important parts, so you might be interested in that as well. We should be getting one of those soon, so check back for another review! I have been reading your review and found it very useful. But i have a question, i don’t use the original iPod headphones, will a pair of headphones with an L-plug fit into the headphone jack hole perfectly? or not? Also, how thick is the skin itself(mm)? I really want one of these skins as they look stylish! Looks pretty cool. I actually like not having a case for my iPhone. It slides in and out of my pocket easier and the form of it in my hand is quite nice. Plus, it is really sturdy with the glass screen; I’ve dropped it at least 2-3 times (from 3-4 feet off the ground) and it hasn’t suffered. That said, I’d like to see the case on my iPhone. If it’s cool I might buy this iPod Touch Cases . I just gave my son my Ipod3g n he needs a case how do I order this case n how much is it?